Posted on Tue, Apr 10, 2012 : 3:23 p.m. When Patrick Sieloff comes home, he still has to help his parents around the house and take care of his little brother. He’s thankful for it. He’s just a bit more thankful to get away for the next three weeks. 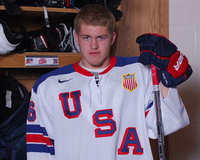 Sieloff and Andrew Copp are Ann Arbor residents in the USA Hockey National Team Development Program, so they didn’t have to uproot when they were selected for the program based at the Ann Arbor Ice Cube. While teammates came from Minnesota, Wisconsin, Illinois or other parts of Michigan to live with billet families, Sieloff and Copp stayed right at home. “My family, they know how I am,” Sieloff said. “You don’t have to tell them, ‘I don’t like this’ and they won’t know what it is. While the situation is golden, the players are headed for a brief stay in the Czech Republic in search of something better: actual gold. Both were named to USA Hockey’s U-18 World Championship team. Starting Thursday, they’ll try to win the U.S.’s unprecedented fourth-straight gold medal in the event. A scar extends the length of Copp’s shoulder. It’s a lasting reminder of a sport he loves, one that caused him to sacrifice half the season in his other favorite sport. Copp was Skyline High School’s starting quarterback since the day the school started its football program. He’s also one of the top hockey players in his age group. In the fall, he couldn’t play on the NTDP’s U-18 team because he was leading the Eagles on the gridiron. The plan was that once the football season was over, he would begin playing in games on the ice. But in Week 7 in a game against Temperance Bedford, Copp stretched for an extra yard on a quarterback keeper and came down on his shoulder, breaking his collarbone. He needed surgery, which caused him to miss three months. He played just 18 out of a possible 53 games with the U-18 team. After all that, he still got the word last Monday. He was selected to represent the United States at the World Championships. 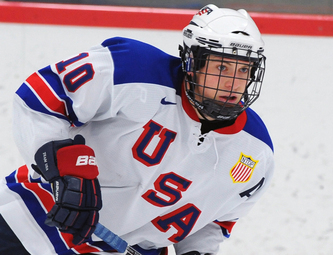 The two-year NTDP invited him into the organization last year. In its 13 years, the program has produced multiple NHL players including the Chicago Blackhawks’ Patrick Kane and the Vancouver Canucks’ Ryan Kesler. 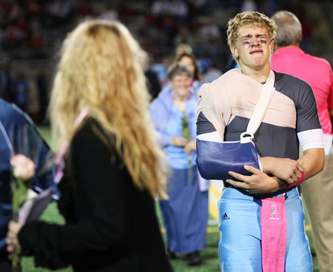 Skyline quarterback Andrew Copp grimaces in pain during senior night festivities after breaking his collarbone in the first half against Temperance Bedford. They came to Copp at the beginning of the year. He was already one game into football season. At the time, the decision was made. Copp lived with it. Halfway through the season, the NTDP came back. They were short on players. They wanted Copp to play. And, oh yeah, he could play football during his senior season, too. Most of the first semester, school days ended a little early for Copp. He would drive over to the Ice Cube to work out and skate, then return to Skyline for football practice. The extra hours didn’t seem to wear him down at all. He passed for seven touchdowns and a state record 557 yards against rival Pioneer. Occasionally, as Copp was opening up the offense and throwing to Purdue commit Jordan Woods, a bunch of Pioneer students would pack the stands. When the hockey team had the rare weekend off, they went to watch Copp play. Nearly the entire team came. “We were all screaming his name and kind of going nuts,” Sieloff said. “He’s unbelievable. After breaking his collarbone, Copp was sidelined. He returned to the U-17 team and put up 11 points in nine games. 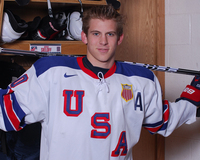 In February, they brought him up to the U-18 team with a simple message from USA coach Danton Cole. In 18 games, Copp added just five points. But the contribution, and ultimately his selection, went beyond the stat sheet. Because of that, when the team starts the World Championships against Finland on Thursday, that USA Jersey will fit Copp well. And vice versa. A defenseman, Sieloff scored three goals and seven assists while playing in all 53 games for the Under-18 team this season. But his offensive game isn’t what garnered him a spot on the team. “There’s a couple things that come out more than anything,” Cole said. “One is just his compete level is extraordinarily high and his desire just to play hard and get after it. You can’t avoid that. And the other thing about him is that he’s a real genuine kid. He’s a good leader. He does the right things. “Those two things together are enough to make you really like him but then you add in the physical skills and how he plays the game and things like that and then you’ve got yourself a pretty good hockey player. It earned him an assistant captaincy and has put him on the top defensive pairing with good friend, Jacob Trouba. The two played together on the Compuware AAA hockey team, alongside Copp and US NTDP teammate Riley Barber, for the better part of a decade before all four were selected for the program. Ann Arbor resident Patrick Sieloff is the 31st-ranked North American skater according to the NHL’s central scouting service. After spending the last year with different defense partners, Trouba and Sieloff were reunited this season. Both stand over 6-feet tall and weigh upwards of 190 pounds. It makes for an intimidating presence on the blue line and measurables that make scouts drool. Both are eligible for the NHL Draft this June. NHL’s Central Scouting has Trouba ranked ninth among North American skaters while Sieloff is 31st. Before they look at the possibility of facing each other in the NHL, they are already guaranteed to see each other in opposing uniforms next year. Sieloff, who grew up going to Michigan hockey games, is headed for the University of Miami (Ohio). Trouba stuck with the Wolverines. Helping out around the house is great. Just not as a college student. But that’s in the future. Becoming world champions, the continuation of the gold-medal streak, is the present. “It’s something you can’t be nervous about but at the same time you have to have fun with it because it only happens one time and you can only make the best of it,” Sieloff said. Wed, Apr 11, 2012 : 8:24 p.m.